Jets Flying Adventure game Try your pilot skills and navigate your paper plane through a cardboard world in the awesome flying game Jets. Watch out for trams and boats along the canals of Amsterdam. Try the fun-packed single player mode or challenge your friends in the multiplayer mode. 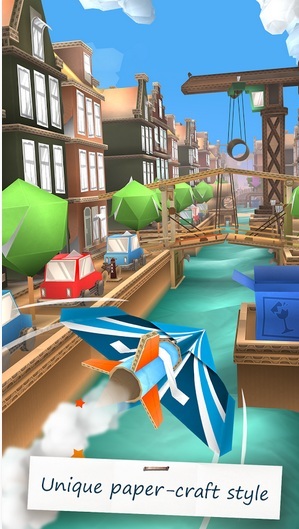 Have you ever wanted to fly a paper plane over the canals? This is your chance! The first endless flyer missions of Jets’ are set in a unique papercraft version of Amsterdam, the home-base of KLM Royal Dutch Airlines. New world cities will be added to the game; one metropolis after another.